The Guildhall has multiple artworks on display around the premises with many of them being displayed in hallways and in the stairwells of the building as well as in our hired spaces. Many of the paintings have been around for centuries with the earliest painting displayed dating back to the 17th century. Located in the King Charles Hall is a portrait of King Charles I by an unknown artist dating back to around 1650. The portrait was taken to be restored in 2017 in the hope it would reveal the artist, however something very different occurred during the restoration. It was revealed that the sceptre painted in the Kings hand was originally a staff that had been painted over. It also turned out that the face seemed to be painted by a different artist than the rest of the body, which was not unusual for artist Peter Lely, who would often paint the face of his subjects and then get a student of his to finish the portrait. However the face of King Charles I was not up to Lely’s usual standard. There was also an inscription on the bottom of the painting, previously covered, saying ‘Henry Jermain Earl of St Albans’ leading restorers to believe that another artist had painted over Lely’s original work of Henry Jermain to turn it into a portrait of King Charles I. King Charles II also has a portrait hanging in the King Charles Hall, painted by Peter Lely also dating back to around 1650. In 1683 King Charles II gifted the city of Winchester with this portrait, the same year he commissioned a new palace to be built in Winchester. By the time he died in 1685 the exterior of the palace was built but James II was unwilling to continue funding the building of the palace meaning it was left in its half finished state. The third portrait of interest hanging in the King Charles Hall is a portrait of Queen Elizabeth II by Edward Halliday from 1957. 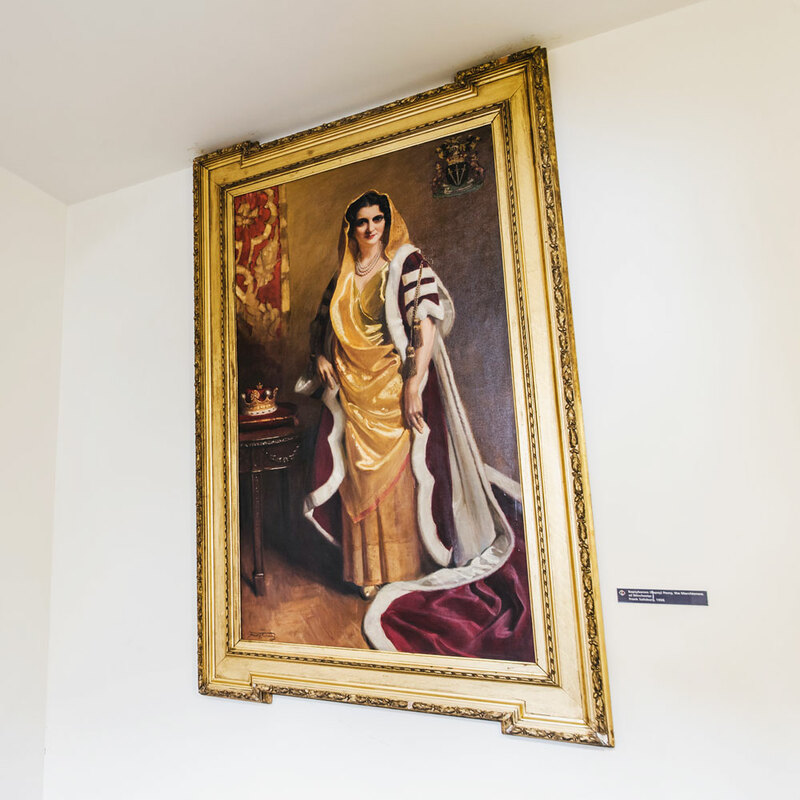 The portrait was presented to the city to commemorate the Queens 1955 visit to Winchester and was entirely funded by voluntary contributions due to an appeal led by Councillor Mrs Thackeray. The portrait hanging in the Guildhall is a version of the artist’s original portrait for the Drapers Company and there are also copies of this portrait found in Southampton and New Zealand. In the front stairwell between the second and third floor there is a painting titled ‘The Children of the Thirteenth Marquess’ by Thomas Stewardson from 1812. The painting depicts the seven children of the Marquess and his wife, whose portraits are also hanging in this stairwell. The five boys all went on to have successful careers in their chosen fields while the daughters both married. However, the interesting thing about this painting is not the children themselves but rather a red shoe that can be seen in the bottom left corner. It has been said that the painting is haunted and that some who have seen the painting have seen the shoe disappear. You could reason the disappearing shoe is down to low lighting making the shoe barely visible, or a person not really paying attention, but those who do believe in the supernatural could see a disappearing shoe in an old painting hanging in a historical building to be completely reasonable. Hanging on the first floor is a portrait of Bapsybanoo Pavry, the Marchioness of Winchester. After her death, Bapsy bequeathed money to Winchester City Council with the stipulation that it was used to create a public hall in her name. 14 years later, the hall, now called the Bapsy Hall, was completed and the portrait Bapsy gifted years earlier was hung by the entrance.